Mission - Australia's Greenest Nappy and Laundry Service! Here at Lavenderia Group, our mission is to make a positive difference to our clients and the planet, in every thing that we do. Every action, every transaction needs to have a positive impact. We are totally committed to becoming a TRULY sustainable business where everything we do is geared towards contribution to others and ensuring that our business only impacts the planet in positive ways. From waste reduction to carbon offsets, from water treatment to giving water, from nappy drives to adopting trees, Lavenderia Group strives to contribute more and more. We are proud Lifetime Members of Businesses For Good and support the myriad of projects through B1G1. We also purchase trees to sequest emissions and are constantly seeking new ways and new technology to take our sustainability efforts to the next level. Having launched Lavenderia NappyCare in November 2011, the company has gone from strength to strength and is now Australia's greenest nappy solutions provider, for home and business. Lavenderia Group now encompasses 6 brands, all committed to the ethos of sustainability and contribution. Offering one of the largest ranges of eco-friendly products for the home and business Lavenderia Group is constantly seeking new technologies and products to pioneer solutions to issues of sustainability across Australia.
" Operating a 'truly' sustainable company is no easy feat, let me tell you! Decisions take longer, products are scrutinised and technologies constantly sought to provider better, greener options, every day. There is no end to it - we are always looking for ways to do more. Why do we do it? Without businesses in Australia, and indeed the world really striving to make a positive difference to their clients and the environment, nothing changes... and if nothing changes, what will our children and their children say about us when we are gone? In our company, we always say that we have to BE the change we want to SEE in this world. If we want a world more committed to living and doing business sustainably, it has to start with us. There are no short cuts; its all or nothing - and that is our commitment to ourselves, our clients and the world. " Pioneering A New Way for Australia! Industry standards ensure hygienic nappies for your family! Lavenderia NappyCare has pioneered a new way of doing cloth nappies, changing 'The Great Nappy Debate' of what is green and what is safest, forever. Where once cloth nappy services used copious amounts of toxic chemicals and nappies required folding and pinning - all of that is in the past when you switch to Lavenderia NappyCare. Easy to use, specially designed and shaped nappies make it just as simple as using disposables - REALLY! Our revolutionary green laundering practices coupled with industry standards mean that your nappies are always hygienic and safe - every time. With every disposable nappy that was ever made still in existence somewhere in the myriad landfills throughout the world, Lavenderia NappyCare provides the best alternative to what has become an unsustainable practice that our children and their children will pay for, again and again. By providing tailored services to suit any budget coupled with green laundering processes AND a tree purchased to offset emissions - you just cannot get any safer, greener or more convenient than Lavenderia NappyCare! Studies have shown that simple everyday items we take for granted like perfumes, household bleaches, plastics & other chemicals are laden with toxins that build up in the blood stream and tissues of our childr﻿en. These things are all used in production of disposable nappies and leach from the nappy affecting the long term health of our babies, not to mention ground and storm water. All humans in this day and age have a certain build up of toxic chemicals in their blood, tissues and organs. This build up is referred to as a person's 'Chemical Body Burden' and represents the amount of chemicals present in every person - including your child - from birth throughout their life. 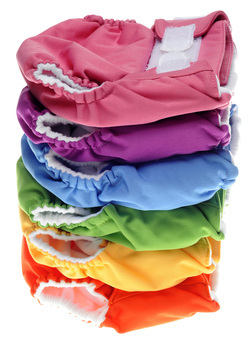 Using our modern cloth nappy service is a great way to start decreasing your baby’s 'Chemical Body Burden'. If you want to find out more about 'Chemical Body Burdens' and how to protect the health of your children now, then check out the information available from Chemical Body Burden and the Environmental Working Group. Want to know more about what is actually in disposable nappies that is so harmful? Read our blog or check out the analysis done by Toxipedia. Lavenderia NappyCare makes it super easy to do cloth nappies at home. We provide everything you need in one handy Starter Kit at no upfront cost,* making cloth an affordable option for ALL families. Even if you already own your own modern cloth nappies, we can wash and dry them for you to Australian Laundry Standards (ASO4146) saving you time, effort and stress. Our cloth nappies are shaped and fitted, just like a disposable - with built in anti-leak gussets and super absorbant inserts. No pins, no folding - its as easy as one - two - three! Check out our easy to use, super convenient nappies via our User Guide here. Where time and money considerations have previously made using modern cloth nappies difficult we are ALL about providing convenience and even SMS you to remind you when to put your nappies out for us to collect. It really could not be easier for you or your family to make the switch! How Do You WASH The Nappies? We offer commercial laundering of all styles of modern cloth nappies, washed to the highest industry standards (ASO 4146) using environmentally friendly processes where possible. Our methods are unique in Australia and are revolutionary, because we put the environment FIRST, not last. We also buy a tree to offset emissions for our customers** giving you guilt free deliveries every week. Sign up for one of our services NOW! Click here. * Starter Kit hire is included free of charge for every booking over 6 weeks. A $30 flat fee for hire is charged for bookings under 6 weeks. ** Trees are purchased for every customer who stays with the service for 6 months or more and are planted at the end of the calendar year by Carbon Neutral.